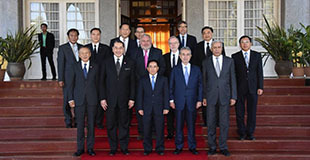 On November 29, 2016 in Vientiane, Lao PDR, the Professor Dr. Surakiart Sathirathai, Chairman of the Asian Peace and Reconciliation Council (APRC) leads the APRC delegation consisting of H.E. Tun Abdullah Ahmad Badawi, former Prime Minister of Malaysia, H.E. Shaukat Aziz, former Prime Minister of Pakistan, H.E. Jigmi Thinley, former Prime Minister of Bhutan, H.E. Alfred Gusenbauer, former Chancellor of Austria, H.E. Jose Camacho, former Secretary of Finance of the Philippines, H.E. Weerasak Kowsurat, former Minister of Tourism and Sports of Thailand, Dr. Sorajak Kasumsuvan, former Vice Minister of Foreign Affairs of Thailand, and Professor Dr. David Kennedy, Professor of Law and Faculty Director, Institute for Global Law and Policy, Harvard Law School, at the Office of the President, Lao People’s Democratic Republic to pay a Courtesy Call on H.E. Mr. Phankham Viphavanh, Vice President of Lao People’s Democratic Republic. 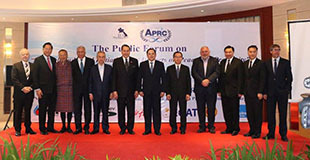 On November 29-30, 2016 in Vientiane, Lao PDR, the Asian Peace and Reconciliation Council (APRC) holds the 4th Annual Meeting of the Asian Peace and Reconciliation Council. On 29 August 2016, H.E. 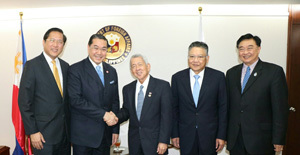 Professor Dr. Surakiart Sathirathai, Chairman of the Asian Peace and Reconciliation Council (APRC) and H.E. Dr. Sorajak Kasemsuvan, Council Member and H.E. Kobsak Chutikul, APRC Secretary-General, to pay a courtesy call on H.E. Dr Vivian Balakrishnan, Minister of Foreign Affairs of Singapore, at the Ministry of Foreign Affairs of Singapore. On 10 August 2016, H.E. 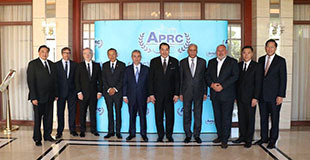 Professor Dr. Surakiart Sathirathai, Chairman of the Asian Peace and Reconciliation Council (APRC) led the APRC delegation consisting of H.E. Mr. Lito Camacho, Former-Secretary of Finance of the Philippines, H.E. Dr. Sorajak Kasemsuvan, Council Member and H.E. Kobsak Chutikul, APRC Secretary-General, to pay a courtesy call on H.E. Perfecto Yasay Jr., Secretary of Foreign Affairs of the Philippines, at the Ministry of Foreign Affairs of the Philippines, Manila.